Annuities are great investments that allow retirement funds to grow on a tax-deferred basis. Money can be invested in a qualified retirement plan or a non-qualified investment to supplement retirement funds. Income after age 59 1/2 can be taken as lump-sum distributions, period payments or become annuitized based on the life expectancy of the annuitant. 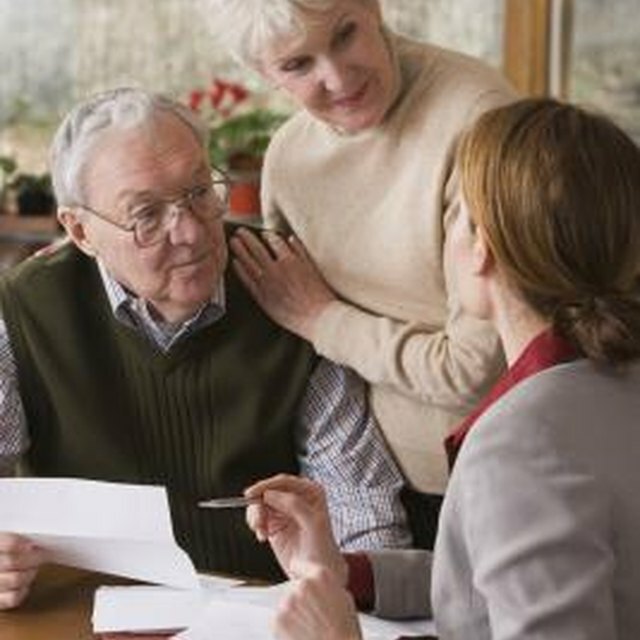 An annuitized payment can be selected on employer pension plans as well. Consider what cash needs are required for what period of time. If you only need monthly income, a lump-sum payment makes no sense since the distribution will be taxed as income. Review the annuity contract to determine what options are available: lump sum, systematic withdrawals, lifetime income, period certain or period certain plus life. Periodic payments and partial distributions can be started and stopped as the annuitant desires. Other options that create regular payments for life, called annuitizing, cannot be stopped or adjusted once started. See the Tips section for an explanation of these options. Request distribution paperwork from the insurance company and fill out the option that best fits your cash needs. If money is needed for a down payment on a new car, then a one-time partial distribution is best. Disbursing the interest to supplement income is another option; it keeps the principal intact. If the entire annuity will be used as the income source, the company will need to determine the amount payable based on age, life expectancy and the amount in the contract at the time of annuitization. Send the paperwork in and wait for your check, which can be deposited or cashed at the local bank. Remember, you will receive a 1099-R for funds taken out of the annuity. For qualified annuities, this is all money. For non-qualified annuities, the taxes are generated off of earnings and not the cost basis, which is the amount put in. If a lump sum is needed from an annuity contract that has already been annuitized, go to Step 5. Otherwise, you are done. Find a "factor" if you need a lump sum payment after you have flipped the switch and annuitized the contract. Since the annuitization cannot be undone, a factor buys receivables for a discounted price. The factor will determine the present value of the contract and buy the annuitized contract for a discounted price, giving you a lump-sum payment. JG Wentworth is one such company that buys annuitized contracts for lump-sum payments. Lump-sum payments take the entire amount out. Systematic withdrawals simply mean that the annuitant is taking out a certain amount that she chooses until she stops it or the money runs out. "Lifetime income" means annuitizing the contract so as to not outlive your money. "Period certain" involves annuitizing to make a specified payment for a specified period of time when the money will run out. "Period certain plus life" annuitizes the contract and pays much like "period certain," but if the annuitant outlives this period, she will still receive monthly income.